As travelers continue to shift towards mobile travel planning and booking, as well as using multiple electronic devices during the path to purchase, Destination BC has more opportunities to reach travelers but less time to grab their attention. To complete for the traveler’s attention, in what has become a crowded advertising environment, we must strive to create emotionally compelling, relevant, and helpful brand storytelling and travel information, and distribute this content through our owned channels (HelloBC.com, social media and email) alongside platforms where travelers now spend much more of their time – Google, Facebook, Amazon, WeChat, Ctrip, to name just a few. Our consumer marketing activities are now primarily focused on reaching savvy travellers through digital-only channels. Our channel choices are market-specific, based on the consumer insights we have from research, anonymous consumer data, and our market development and in-market teams. 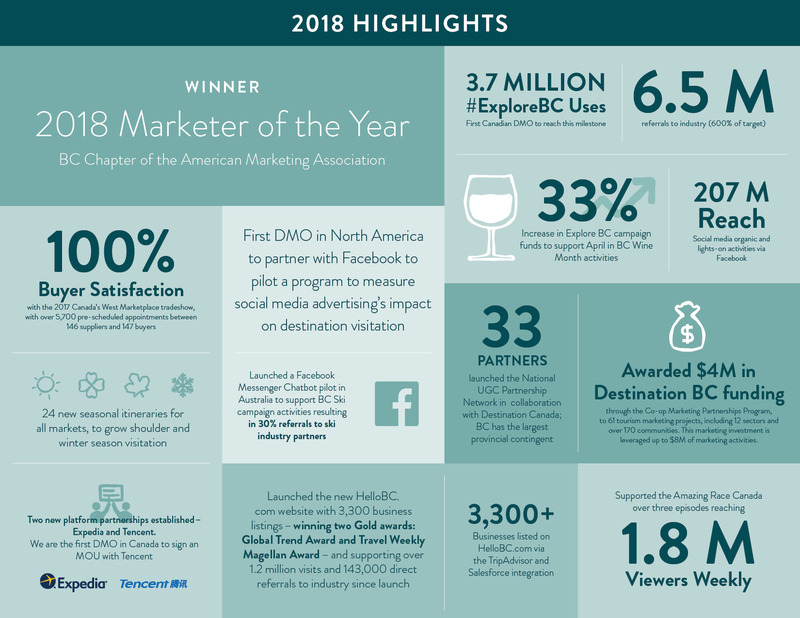 We currently develop and execute three integrated marketing campaigns – Explore BC, Global Brand, and Global Ski – which all use a mix of display, native, social media, OTAs, and premium publishers to reach our target audiences, which vary by campaign and market.